Some of you may have seen the following viral YouTube clip of a cute little girl and her “catchy” dance. What starts out as an ordinary “home” video, turns into a remarkable work of special effects and creativity. Like most viral videos, you see it once or twice and move on, but given my line of work, this one made me reflect a bit more. In short, it is a great illustration of how we influence people in ways we don’t even know. Thanks to the pioneering research of Nicholas Christakis and James Fowler, we are learning that the essence of this web-sensation is actually not that far from reality. 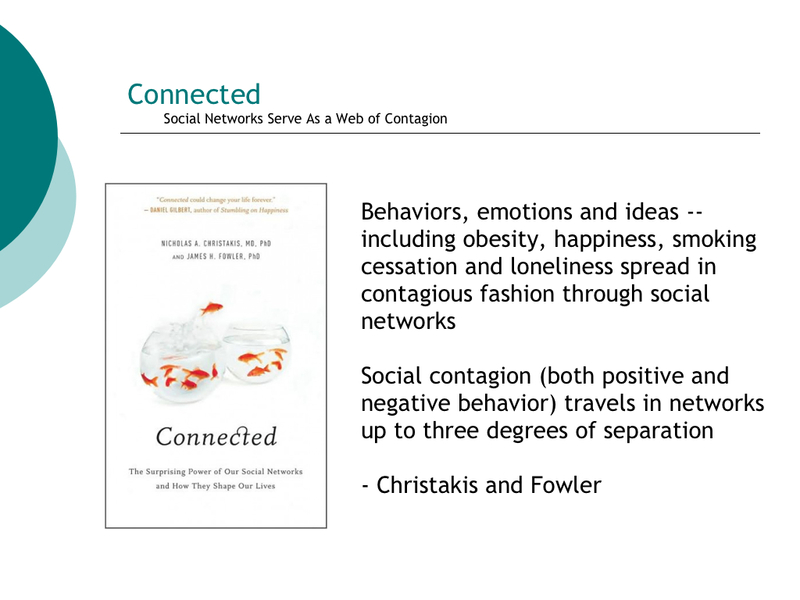 Ideas, behaviors, and even things like obesity, spread through social networks in contagious fashion. The video does a nice job of demonstrating how dance moves can be contagious too, spreading quickly from child to adult and beyond. If positive and negative behaviors can travel in networks up to 3 degrees of separation, what are the implications for organizations and businesses? To date, I have asserted that mapping key hubs within organizations is essential for helping them uncover the hidden linch-pins critical to day-to-day operations. Given the latest research on social networks, what does the following map tell us about influence in the workplace? Go three degrees out and 80% of the company is touched via one, very central employee. An employee who is perceived, by peers, managers and subordinates alike, as a key contributor to a positive and productive work environment. Employee 121 is not the CEO, nor do they sit on the leadership team (not surprising given talent and influence transcends hierarchy), yet if the research about behaviors and social networks is true, this person commands a great deal of power in the organization. What if they are not on board with the company strategy/direction? What if they are thinking about going elsewhere? What if they come to work and woke up on the wrong side of the bed? We all influence each other, but highly connected individuals, such as employee 121, can affect a lot of people. Most of the stress in the organization is emanating from just 3 individuals. Wouldn’t you want to know who these people are and take steps to coach, mentor and expose (to them) how they are affecting the people around them? I am sure they do not wake up thinking, “How many people can I piss off at work today?”. Showing an anonymous visual map of their influence, can help crystallize matters and move them in a direction of positive change. With this kind of information, companies can more effectively manage talent and/or mitigate negative influencers that have far-reaching effects on the health and well-being of an organization. Furthermore, firms can leverage/mentor the key influencers to more efficiently drive change, strengthen culture and build morale. While some business leaders would contend that they know who these people are, our experience has shown there are always surprises. Invariably, the social mapping process uncovers hidden influencers – a finding consistent with the business literature, which affirms that managers and executives frequently mis-identify their best networkers. It is why articles in Harvard Business Review have stated that “mapping employees’ relationships can help managers harness the real power in their organizations”. So, before you can “use your influence[rs]”, as the cute-catchy-dance-video suggests, we think you ought to know them first! Pingback: Simoleon Sense » Blog Archive » Know Your Influencers!